This Halloween, go for the BOO! That’s right, we’re talking scary costumes. Sure, Halloween is fun when you’re pretty, or cute, or you look like your favorite TV character. But the real spirit of All Hallows Eve is in the fear, so get in the clear and get some of our scariest costumes this season. Our Children’s Pirate Costume with 3D Chest is as bad as it gets. Everyone knows pirates love to pillage and find the gold and jewels at the bottom of the ocean. Add the extra oomph to your pirate costume with our built in 3D chest. You’ll never have such sculpted muscles again, especially at the age of 10, so rock it while you’ve got it! This costume includes costume with built in chest, pants, headpiece, belt and eye patch. For something even spookier, try our Bleeding Skeleton Zombie Costume. This number is as frightening as it gets! It includes a mask that will make you look like you’ve risen from the dead, and a bleeding chest piece to match. You might want to stay away from younger trick or treaters, and those who are easily surprised, because this costume is bad to the bone. Jump on the vampire bandwagon this year with one of the scariest costumes in history! Everybody knows vampires can only survive by sucking blood, so snag some of our fake blood and love bite teeth to match our Classic Vampire Children’s Costume . People may run away screaming, but hey, if you can’t dress scary on Halloween, when can you?! 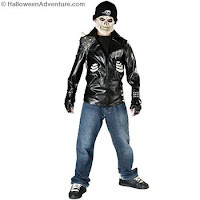 Ride or die this Halloween with our Dead City Choppers Dead Rider Costume. This number is scary as can be with a black pleather jacket with sculpted EVA detailed ribs & shoulder piece, an extremely frightening vinyl skeletal mask with attached cap, and studded black gloves. This costume isn’t something to mess with! Another scary option is our Doomslayer Tomb Slayer Costume. This getup includes an incredible mask that makes you look as though your flesh has been melting off for years, and your teeth have been rotting but won’t fall out! It also includes a tunic that portrays bloody, decaying ribs, shoulder pieces, a headscarf and a belt. This is one costume you’ll want to bring back from the dead again and again.